So, you shot about 3000 photos to build a time-lapse video. Now what? 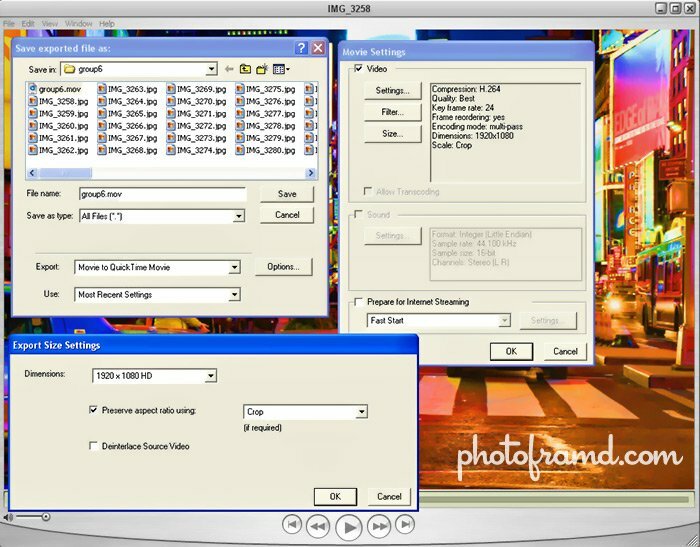 The easiest way is to use a program that can import an image sequence for use as video or animation. After spending a hour with Pinnacle’s Studio HD, I am disappointed to say that it cannot. So falling back on Philip Bloom’s DVD, I used QuickTime Pro. 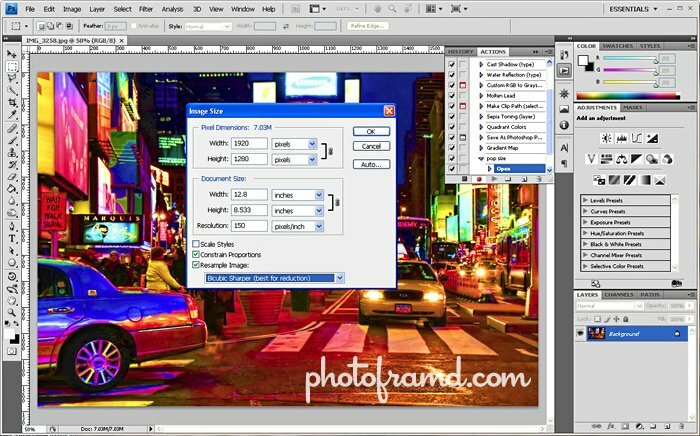 Create an Action in Photoshop to resize the photos to 1920×1280. You can also add into the action other Photoshop steps like color enhancements. When you are finished include Save As to a different folder. Never over-write the original file. Use this Action in File > Automate > Batch to convert all of the files. You can skip this step and have QuickTime Pro resize and crop the photos, but I think Photoshop produced better/quicker results. 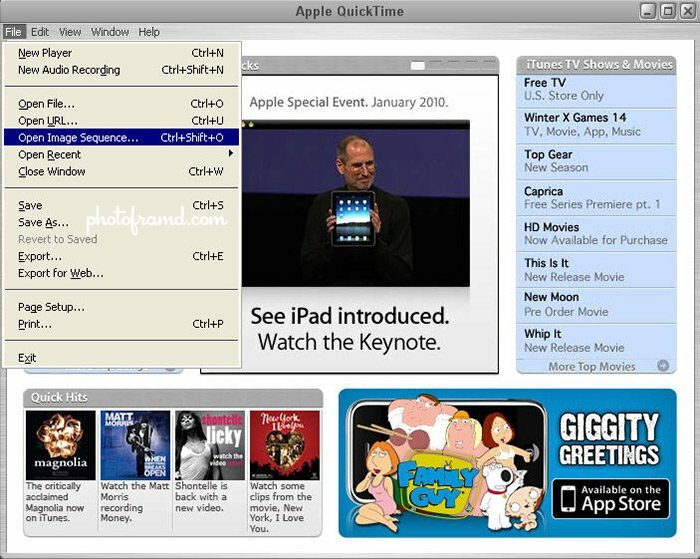 Only QuickTime Pro will work. For $30, it’s worth it. But, the images must be numbered sequentially for the import to work correctly. Select the Open Image Sequence to start the process. Make sure all of the images are in the same folder. Select the first image in the sequence. You also must specify the Frame Rate at this point. If you are planning to use 24fps, then you want to select 23.976 (the REAL frame rate). Just click the Open button and give it a minute to import. Once imported, you can play the movie through the QuickTime Player. If you are happy with the results, select to export to QuickTime Movie and click the Options button. Click the Settings button, and select H.264 Compression with Best Image Quality. Now for the important part, click the Size button. From the drop-down, select 1920×1080 HD for Export Size and Crop with Preserve aspect ratio checked. That’s it. 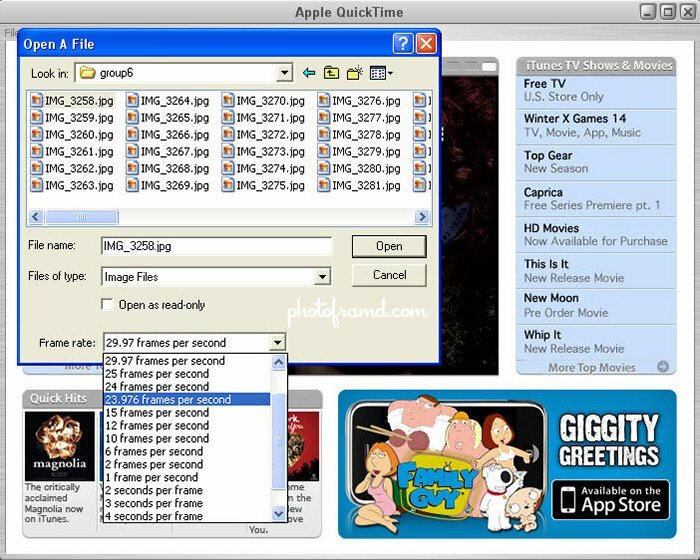 You can now import these HD QuickTime Movies into Studio HD or any other video editor just like a Canon 7D movie. You can see my final time-lapse movie called Time Square Pop here. You need QuickTime Pro to export the video. And, yes, Philip Bloom is using Pro in his video. Awesome write up! One question, how do you make an action for photoshop? That’s a whole other lesson. There is a very good tutorial here. Can’t you use something like Premiere or AfterEffects? If you have PS many people will likely have one of those two programs. Sure. Since upgrading to the CS5 Master Collection, I have been including articles on both Premiere Pro CS5 and After Effects CS5. However, not all photographers have these programs, only those that have purchased either the Adobe Production Premium Suite or the Master Collection. Considering Adobe increases the upgrade price with every update, there will always be people looking for cheaper alternatives. Pinnalce’s Studio HD is a great alternative for under $100. You also have many photographers who never would have even thought about HD-Video until it was included on their new DSLR like the Canon 7D. In my case last year, I had already upgraded to CS4 Design Premium Suite when I purchased the 7D. Adobe did not offer a cross-update for either the CS4 Production Premium or the CS4 Master Collection. In essence, I would have lost the value of the upgrade which I already purchased. Adobe should be more flexible in their upgrade paths especially when they are increasing the cost of each upgrade. Hi do you have any help for adobe users? I have planned a time lapse tutorial using Premiere CS5. I actually have a great sequence already shot. But, other things keep coming up and I have put this tutorial aside for “a rainy day”. I will let you know when it is available. I just tried importing directly into Sony’s Pro Vegas 10.c. I did not have to buy QTPro. Since the photos are sequentially numbered off the card, they just rippled right in. I’m going to play around with this as I did not resize them first, since I don’t have PS to do this, but I think that I can both convert their size and convert into TIFF to gain an alpha channel using something like Infraran (sp?). I’ve done it with smaller amounts of stills. Also, wondering about what is the right length for a still? At 24 frames per second, how long do most of you do your frames for? Do you mean image size? 1080p uses images at 1920 x 1080 pixels. Do you mean duration? 24 fps means each image (frame) is displayed for 1/24 of a second. That means 1440 images just for one minute. You can extend the duration of each image by slowing the frames (ex. applying a Slow Motion filter or changing the frame rate properties). For example, by changing the frame rate to 12 fps, you can make the same 1440 images last for 2 minutes. You will need to test the video to see if you like the results. Understood. My question was more about how many frames are needed to actually display something that is viable in timelapse. If I’m shooting a sunsent, for example, do I take 24 shots every time I shoot for x amount of time? Or when you stitch it all together does shooting one frame/image per interval add up to a seemless flow? I guess I’m curious because does the eye even register a change of one frame out of 24? Let’s see if can illustrate for the math impaired. For example, if I’m shooting a sunset, and I want 30 seconds of finished footage I would set the time on the 7D accessory to take 720 images, but set to what duration? Do you take one or 24 every 60 seconds? How many seconds is just enough to do the job with time lapse? When I watch something like Philip Blooms’ timelapse, is that one image per shoot or more? FCP and Vegas both have speedup and slow down automation tools to easily change the speed, once I get it in. Di you see my other article Tips on Shooting Time Lapse Video? It all depends on how smooth you want the movement and how fast the subject moves. For people, shooting with 1 or 2 second intervals will cause the traditional stop-motion effect. For smooth moving clouds, it will vary based on the wind speed. If you can see the clouds moving, then a shorter interval will be necessary (possibly 1 or 2 seconds with high winds). If it is calm and you can not perceive the clouds moving, then a longer interval of 30-seconds would work. Web videos can stretch the frame rate to 15 fps as long as there is not much movement. However, if there is a lot of movement, 24 fps or 30 fps would look smoother.